The Explorer Evolution hard shell, roof top tent offers a new way to look at camping and 4WD adventure holidays. With larger internal space the Explorer Evolution provides sleeping space for two adults and a child. Price is quoted as pick up from Outback HQ. 640 Dorset Rd, Bayswater, VIC, 3153. *note delivery is approximately 2 weeks from time of order. – You will be contacted with an ETA at time of order. It takes only one person 8 seconds to set up and is simply a matter of releasing the catches and letting the four AL-KO struts raise the upper hull, creating the tent walls as it expands. 8 Seconds and your ready for bed! Just as easy to pack away. Pull down the upper hull and the tent draws back into the shell using a clever elasticized seam that is sown into the tent walls. Once the latches are secured, your on your way again. 25 seconds to pack up? How does that compare with what you’re currently using? Able to withstand the most extreme conditions the Explorer Evolution is completely waterproof and wind tested to 120km/hr. There’s some comfort in knowing that your sleeping space offers much better protection against the extreme weather than conventional tents. In the event of hot weather the design of the Explorer Evolution allows for air to circulate freely through the tent through the screened windows and openings. A solar powered vent built into the upper hull creates extra ventilation. This unit even allows for the blades to be reversed turning it into an exhaust fan. Using this fan will help avoid condensation that may build up in the tent. 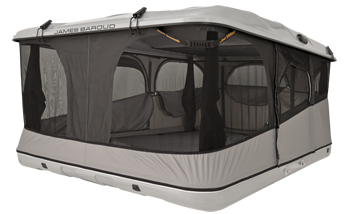 With all the openings and doors completely screened and flaps secured shut by Velcro you’ll sleep easy knowing you are protected from annoying biting insects and snakes. These flaps also protect your privacy. The back door, 2 side doors and front window also have built in rain awnings which allow the doors and windows to remain opened while preventing any rain coming in to the tent. 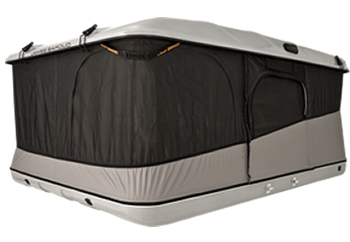 Every roof top tent comes with it’s own high-density mattress and protective cover. The mattress has an ISO world rating for air permeability, which means it breathes, allowing air to circulate to keep the mattress fresh. Internal fittings include 2 removable storage pockets and a ceiling storage net with internal lighting supplied by a rechargeable LED torch. Access is easily gained using the folding ladder provided with each tent. The ladder attaches to the lower hull and the specially designed, telescoping legs adjust to the movement of the vehicle as you enter and leave. Available as an accessory is a custom luggage bag that secures into the upper hull with Velcro straps. Zippered at the rear for easy access, internal straps to secure your possessions and 100% waterproof. They really have thought of everything. A clever alternative to bulky, traditional tents and a fantastic solution for 4WD touring, the Explorer Evolution roof top tent is an exciting new way to get a comfortable and secure sleeping space and create new freedom in the way you travel. All James Baroud roof top tents are backed by a 5 year guarantee on the fabric, hull and mechanism and are proven through exhaustive research and testing. Selection by support crews in the Paris to Dakar rally serves as further assurance to the reliability and durability of these remarkable innovations.